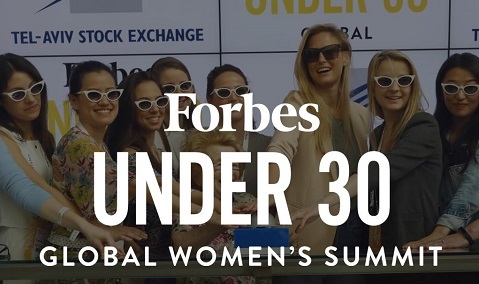 Forbes US will host in Israel its first ever Under 30 Global Women’s Summit. The conference will take place from March 31 to April 4 in Tel Aviv and Jerusalem. According to Forbes US it will be “VIP experience with workshops focused on propelling women-led businesses”. There will be seminars in the field of business, art, politics, and philanthropy. The attendees will visit the Tel Aviv Stock Exchange, Jerusalem’s Old City, a venture capital campus, and a fashion show in Jerusalem’s historic Mahaneh Yehuda marketplace. Forbes wrote on their twitter: “Imagine this: 5 days in Israel with fellow visionaries collaborating, networking and learning from each other, world-class mentors and Under 30 honorees. It’s real. Meet the first-ever Global Women’s Forbes Under30 Summit (men are welcome)”. This is Forbes’ first event of this kind, but it isn’t the first time that Forbes US visit the “Start-Up Nation”. Last year, it hosted the annual Forbes Under 30 Summit Global in Israel, bringing together some 800 guests from the previous Under 30 Summit in the US and regional summits from Asia, Europe, the Middle East and Africa. The attendees, from 38 countries, spent four days touring Israel, participating in workshops and listening to talks by top speakers including Waze co-founder Uri Levine, entrepreneur and investor Yossi Vardi, high-tech founder and social entrepreneur Dr. Erel Margalit (JVP), model and entrepreneur Bar Refaeli, and others. Among the list of the top 50 women in tech, five are Israeli, three appear on the global list and two are part of the European list: Dr. Michal Tzur, Dr. Tal Rabin, Danit Peleg, Galia Ben Artzi and Limor Shmerling. The list of influential women published by Forbes Israel in 2018 includes Ayelet Shaked, Esther Hayut, Karnit Flug, Shari Arison and Dorit Salinger.